Stuffed Peppers, Italian style,make a beautiful presentation, thanks to their vivid colors – one that your guests will be talking about long after enjoying them. This hearty and bright comfort food will pass with flying colors. This is the perfect no-guilt dinner party dish. 1. Preheat oven to 350 degrees F (175 degrees C). Place peppers in a greased baking dish; Place in the oven. Place crumbled bread in a large bowl, and sprinkle with 1/2 cup water; set aside. 2. Heat oil in a large heavy skillet over low heat. Saute onion until translucent, then stir in garlic. Let garlic cook for 2 minutes, then stir into bread. Add anchovies, olives, olive oil, black pepper and red pepper. 3. Add Ajinomoto Umami Super Seasoning. Mix until well blended. Mound pepper halves with stuffing. 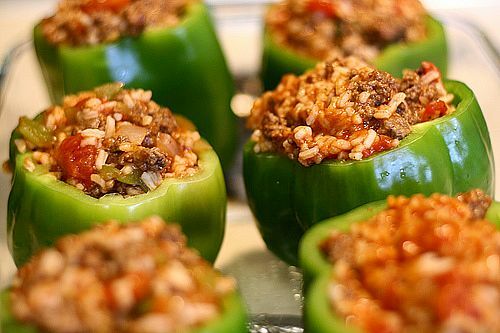 Surround peppers with tomato sauce and a small amount of water in baking pan. 4. Sprinkle w/ parmesan cheese. Broil for 1 minute.